A sewing machine; a television set; work and recreation; female prisoners and a bank. You can say these are as contrastive as apples and oranges, milk and water; yet, they came together today to give some small level of hope to an institution in need. "The significance of AIDB's contribution today will have a lasting impact on our efforts for providing rehabilitation for those in our charge," said Denis Blanc, the acting Superintendent of Prisons at a simple ceremony behind the thick foreboding grey walls, lined with vicious-looking barbed wire, of the Stock Farm Prisons. In a place like that a 14-inch colour television is virtually a life-saver (or a boredom buster); and a sewing machine? What about finding creative work for idle hands to do? 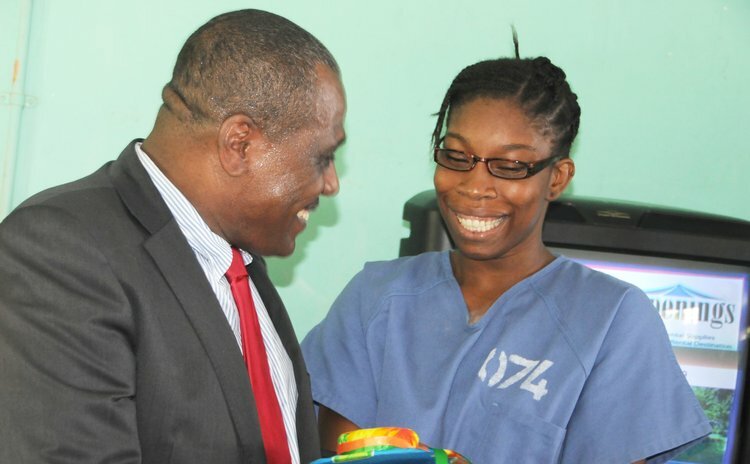 While handing over the equipment, valued at about EC$5,000, Julius Corbette, the manager of the Agricultural and Industrial Development Bank (AIDB) didn't say so exactly but he jokingly told the seven female inmates of the prison that they must not fight over the sewing machine or "over the remote control" of the tv. They laughed with girlish glee, apparently happy to be free, even for a short hour, from the humdrum of prison life. Or were they thinking that the prison officers may let them watch "Young and Restless" sometimes? Will you, Mr. Blanc? Especially if the prisoners use the machine and save your prison service thousands of dollars sewing prison blues?